It’s summer, Vinously Chic readers. And in South Texas that means bring on the HEAT! It’s only June and we’ve already endured 105 degree weather. I’ve got a few must-have summer items for your wardrobe and the perfect cool wine pairings to go with them. Stay cool, my friends. First up are these awesome floral shorts by fellow Texan, Ross Bennett. For any Fashion Star fans, these were featured on the show this season and available for purchase at Macy’s. The perfect wine pairing for these? A floral Albarino from Spain. Up second – be the ‘color pop’ of the party in this vibrant yellow dress from Saks Fifth Avenue. I personally love yellow this season and advise everyone to freshen up their wardrobe with color this season. I was recently spotted doning my yellow Lily Pulitzer pants just a few weeks ago. The perfect wine for yellow? I can’t resist a yellow-tinged, citrusy, and vibrant Sauvignon Blanc from Slovenia. That’s right – Slovenia. I’ve had the pleasure of tasting the Pullus Savignon and it is quite enjoyable. This wine is made at the oldest winery in Slovenia – its cellars dating to 1239 lie labyrinthine beneath the streets of the city of Ptuj. Lastly, I can’t imagine a summer without a stellar swimsuit and a glass of Rose for sipping poolside, lakeside, oceanside, etc. 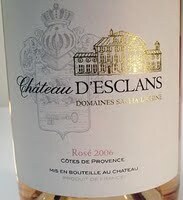 Check out this stylish two piece and make sure to enjoy a Provence Rose, such as the CHÂTEAU D’ESCLANS Côtes de Provence Rosé 2011 ($35). It’s nice and creamy with some plum notes. Enjoy! Follow me on Pinterest to see other great Vinously Chic items (from clothing, to furniture, to entertaining ideas and decorations).